As we’ve discussed previously in our sock style tip series, there are lots of nuances to wearing socks and making sure you correctly pair socks with both your pants and shoes. One common enigma that people who wear socks encounter is how to pair socks with a gray suit — because its very rare to actually own or wear gray socks. 1. Is your suit dark gray or light gray? If your suit is dark gray, you may be able to pull off black socks or any pair of socks that are a darker shade of your suit color (assuming you don’t own socks that are dark gray). If your suit is light gray, you can also try dark gray socks or any darker color sock than light gray (again, assuming you don’t own any light gray socks). In both cases, you want your socks to be darker than your suit color but lighter than your shoe color. 2. What color are your shoes? A backup plan, in the event you are wearing a gray suit and don’t have any gray socks, is to wear socks that match your shoe color. For example, brown shoes would be paired with brown socks. Black shoes with black socks. Don’t wear white socks — they are lighter than your gray suit, and a general no-no in the context of wearing a suit. A wedding is a great event to sport a light gray suit and then some whimsical patterned socks (provided you don’t go over the top with colorful shirts, ties, belts, etc as well!). Looking for a colorful set of socks to pair with your gray suit? 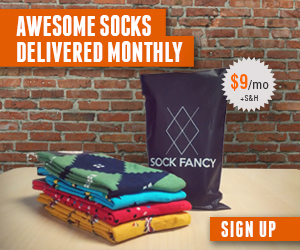 Try out Say it with a Sock’s Sock of the Month Club! Previous Article When is it appropriate to wear white socks?